We just love the Farmington Farmers and Artisans Market. Fabulous fresh produce that inspires you to cook healthy for your family and friends. 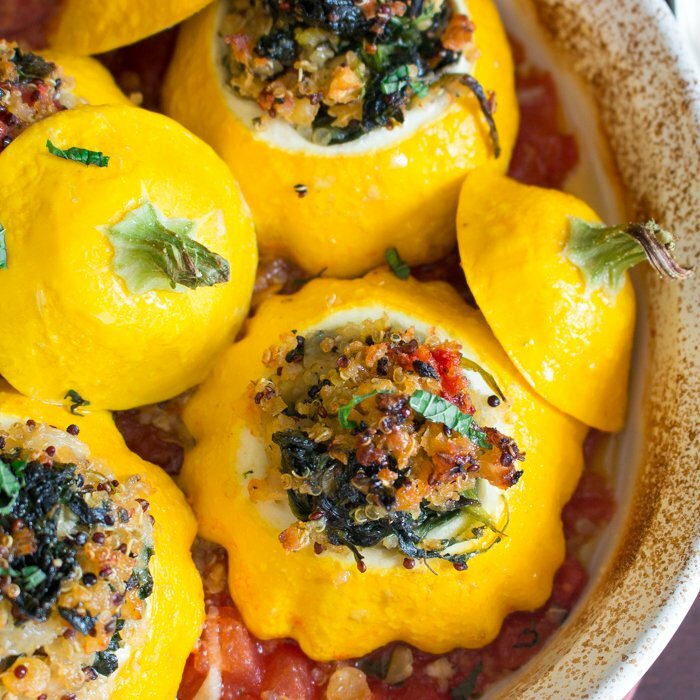 These adorable patty pan squash were just meant to be stuffed. 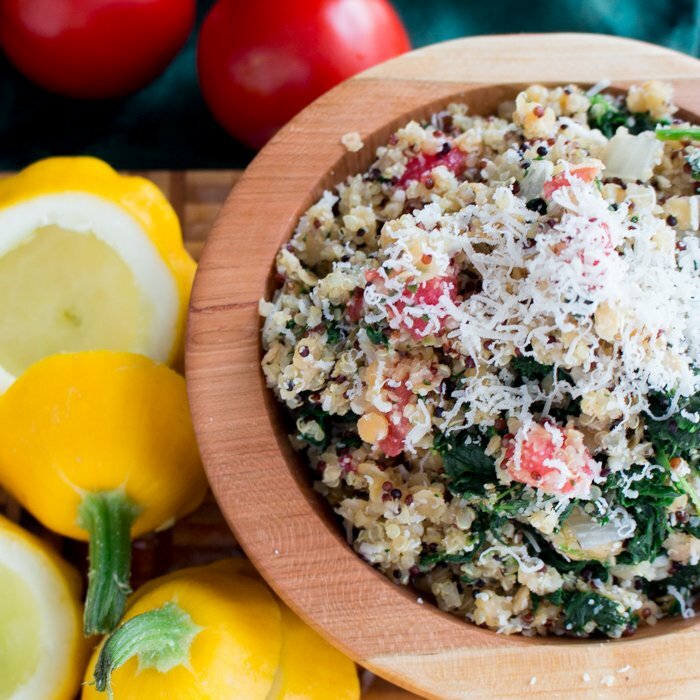 You could stuff these little guys with whatever your heart desires but delicate multi colored quinoa, spinach, garlic, heirloom tomatoes and parmesan is a perfectly delicious meatless Monday meal or a make ahead side dish. Heirloom tomatoes need little prep to create a gorgeous simple marinara tomato sauce to nestle in your little Italian Stuffed Patty Pan Squash while they are baking. 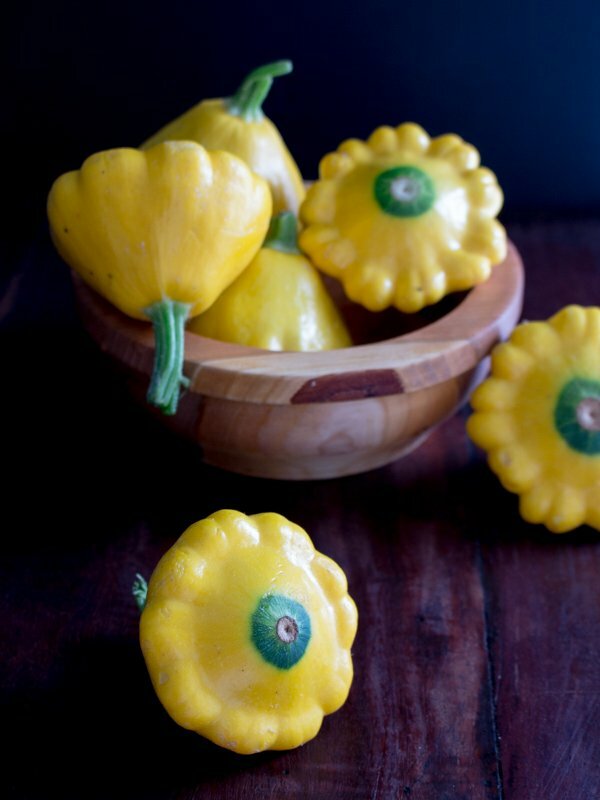 How adorable are these little patty pan squashes! They even have their own little hats. We have a very simple hack for removing the skin from a tomato. Instead of going through all of the bother of scoring the bottom of tomatoes, boiling and then plunging them into an ice bath and then peeling them we have a very simple way to peel tomatoes without all of those steps. To simply peel tomatoes, cut your fresh tomatoes in half and use a large grater and just grate the tomato facing the flesh side into the grater directly into a bowl. The skin will separate from the skin. You will have a peeled grated tomato which is perfect for this recipe. You are going to love the fact that you can do all the prep for these squashes and then just pop into the oven to bake. They reheat fabulously as well too. 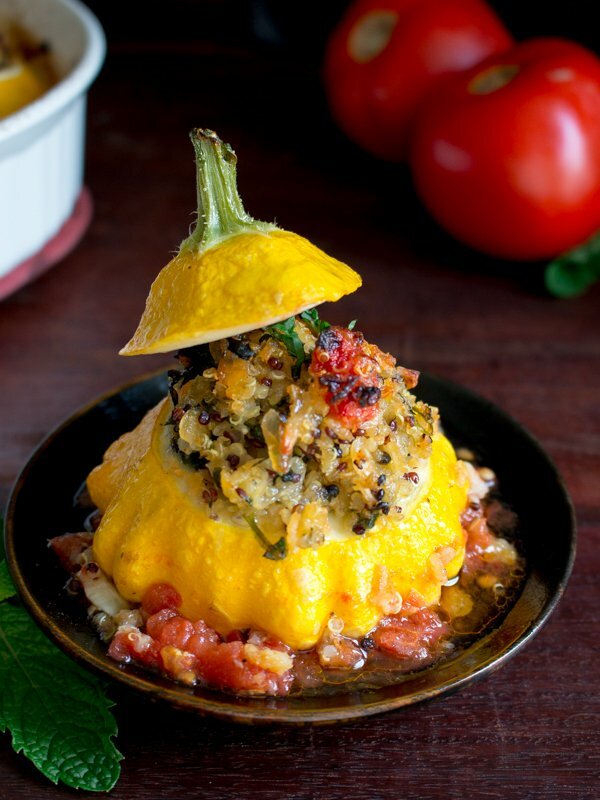 You are just going to love our Italian Stuffed Patty Pan Squash because it is light, lovely, vegetarian and gluten-free too. You could make them vegan/dairy-free easily by swapping the parmesan for a vegan parmesan or just hold the cheese. We are celebrating “Delicious Italy” here on Healthy World Cuisine. If you missed our Baked Ricotta Stuffed Zucchini Blossoms, Homemade Tagliatelle Pasta with Zucchini Blossoms and 3-Minute Vegan Sun-Dried Tomato Pesto be sure to check it out while the August harvest is here. Not only do we love all the Farmers at the Farming Farmers and Artisan Markets, we also love meeting the talented artisans like Jozef John Bouwhuis and his gorgeous hardwood creations. He makes beautiful handcrafted wooden bowls, rolling pins, mortars and pestles and the list goes on. 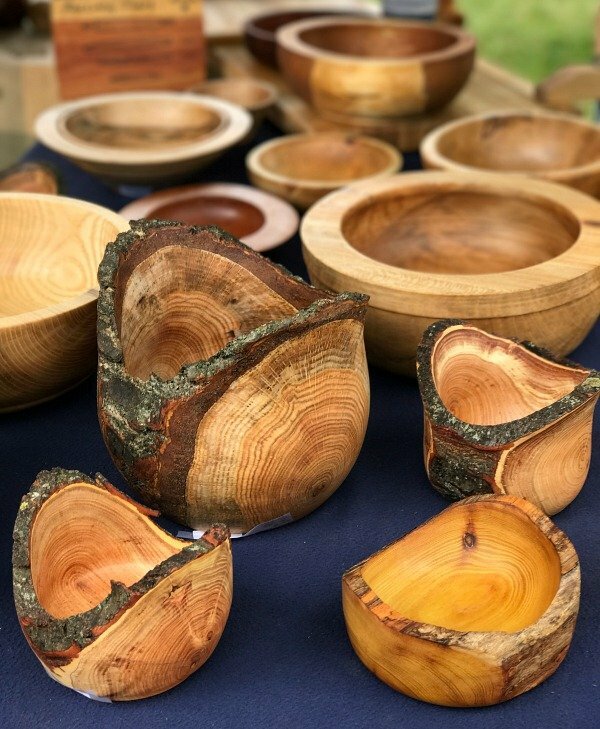 Jozef’s Bowls and Wooden Crafts are only available at the Farmer’s Markets but you can contact him at [email protected] for any questions you may have. We love this gorgeous bowl holding the perfectly ripe patty pan squash that he handcrafted from cherry wood. Do you have your own garden? It is a labor of love or is that a love of labor? spinach – ½ cup frozen (thawed and all the liquid squeeze out) – you can also use 3 cups fresh garden spinach and stir fry or steam just until wilted and bright green. Tomatoes – 4-5 large peeled fresh (we simply cut the tomatoes in half. Grate them flesh side to the grater and then all that is left is the skin and you pitch that- much easier than that whole boiling ice water hack for peeling tomatoes) – add 1 tomato into quinoa mixture and 3 for the tomato sauce. 2Prepare the Quinoa Mixture: In a medium pan add the olive oil, onion, 2 of the 4 garlics and sauté just until translucent. Add the cooked quinoa, spinach, tomato, basil and season with salt and pepper to taste and stir fry until all incorporated – 1-2 minutes. Add parmesan cheese and toss, if desired. Set aside. 4Prepare the Fresh Tomato Sauce: Spray the bottom of a medium sized baking pan 9 x 9 with a little oil or rub with a little olive oil. Place the remaining 3-4 chopped tomatoes, 2 garlic and salt and pepper to taste. Mix to incorporate. 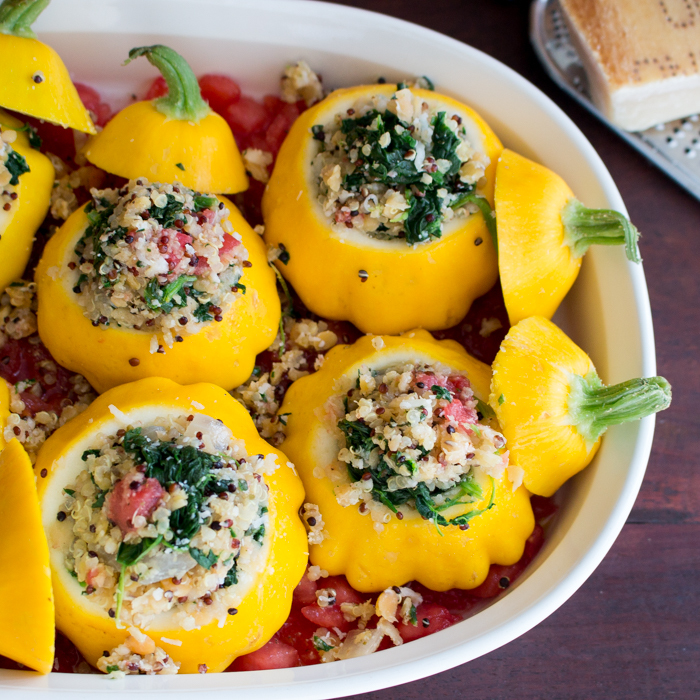 5Place the prepped patty pan squash on top of the bed of fresh tomato sauce in the baking dish. 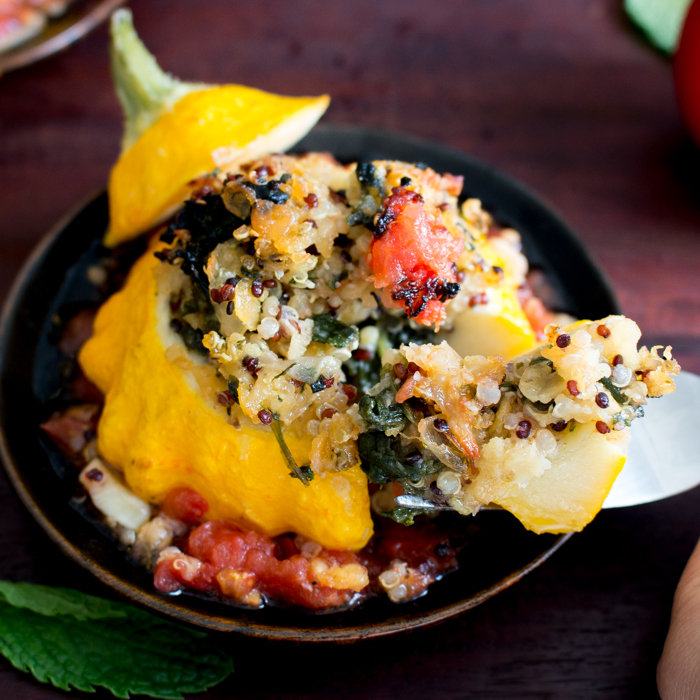 Stuff each patty pan squash with the prepared quinoa mixture press and pile high. 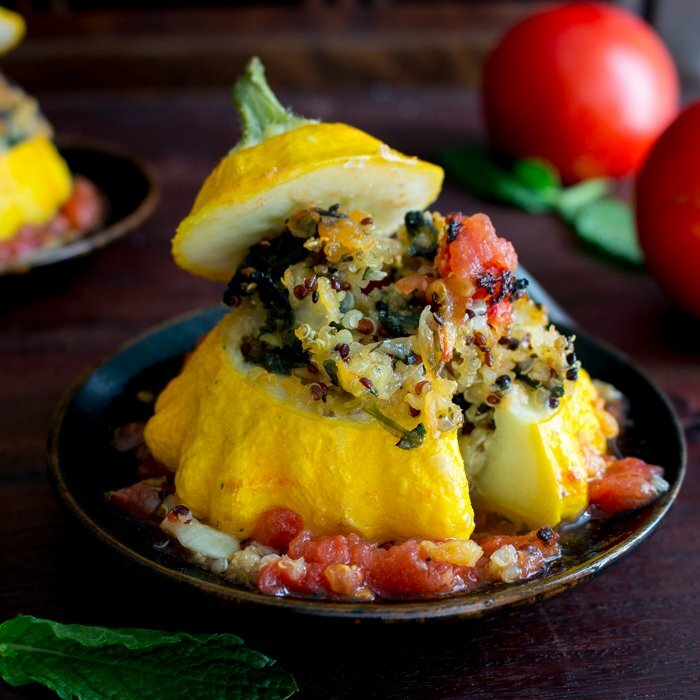 Place the lids to the patty pan squash in the pan. 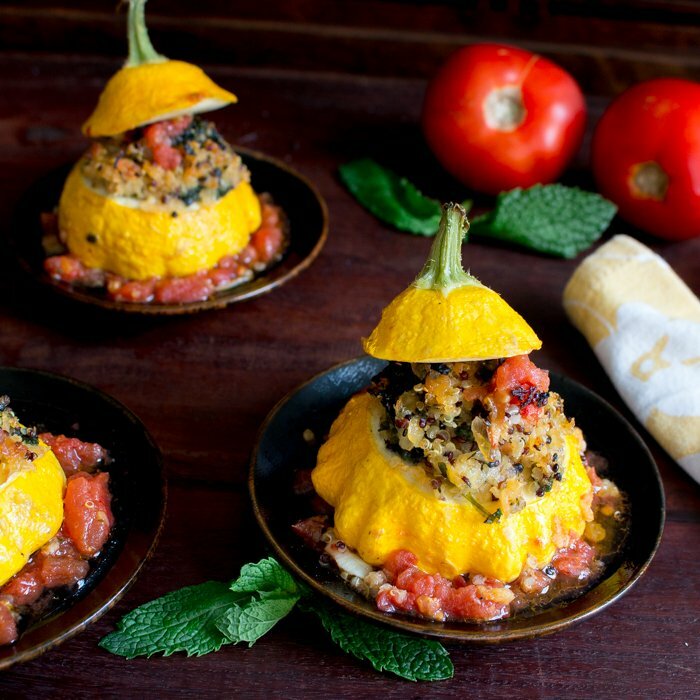 Drizzle the Italian stuffed Patty Pan squash with olive oil and bake for 45-50 minutes or until the patty pan squash are tender. 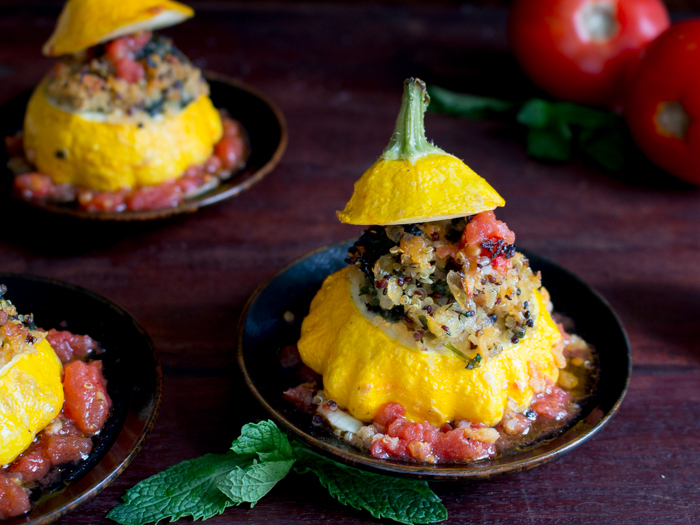 6Enjoy Italian Stuffed Patty Pan Squash with fresh tomato sauce!